Wednesday, September 5, 2018, 11:00 a.m. - 2:00 p.m.
You are invited to the annual Diocese of Fond du Lac gathering of the retired clergy and spouses. The event will be an opportunity to share and network with other clergy and spouses, as well as enjoy a delicious luncheon in a lovely venue. Bishop Matt will be in attendance. The Rev.s Jim and Mary Trainor, Chaplains to the Retired Clergy in the Diocese, are hosting the event. The luncheon will be held at St. Mark Episcopal Church, 415 S Main St, Waupaca, WI 54981 where we will gather in the Garden of Blessing, weather permitting. 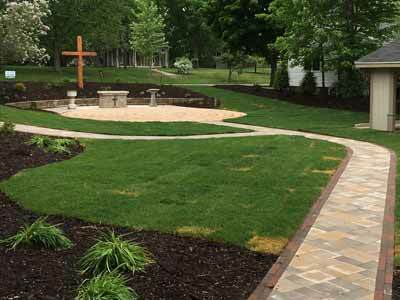 This quiet place for everyone is meant as a place to relax, pray, walk the labyrinth and appreciate God's Creation. Lunch will be served in the Parish Hall. RSVP. The provide hospitality and food, please RSVP to Jim or Mary by August 27 at (715) 258-2168 or trainors3@gmail.com. Also provide any dietary needs you may have when you RSVP.